I have a not-secret love affair with blogging the curve complex: I (intro), II (dead ends), III (connected). I’m surprised I didn’t blog the surprising and cute and wonderful proof that the curve complex is hyperbolic, which came out two years ago. Maybe I’ll do that next math post (but I have a large backlog of math I want to blog). Anyways, I was idly scrolling through arXiv (where mathematicians put their papers before they’re published) and saw a new paper by the two who did the dead ends paper, plus a new co-author. So I thought I’d tell you about it! If you don’t remember or know what the curve complex is, you’d better check out that blog post I (intro) above (it is also here in case you didn’t want to reread the last paragraph). Remember that we look at curves (loops) up to homotopy, or wriggling. In this post we’ll also talk about arcs, which have two different endpoints (so they’re lines instead of loops), still defined up to homotopy. The main thing we’ll be looking at in this post are geodesics, which are the shortest path between two points in a space. 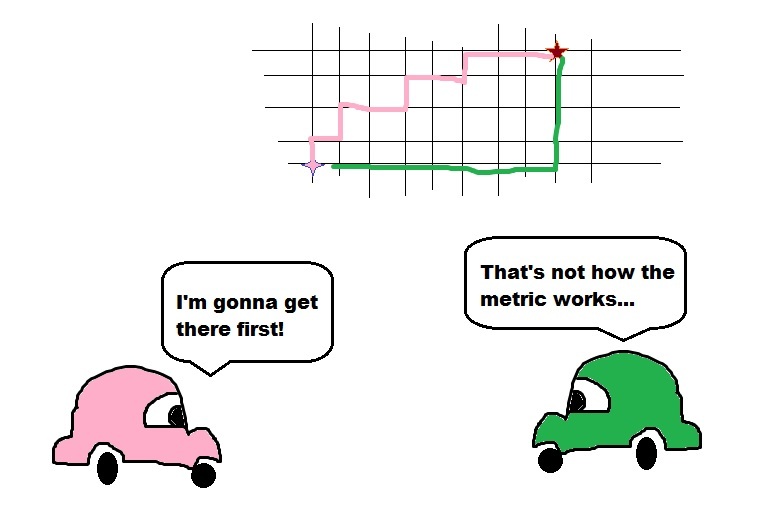 There might be more than one geodesic between two spaces, like in the taxicab metric. In fact, in the curve complex there are infinitely many geodesics between any two points. Infinity is sort of a lot, so we’ll be considering specific types of geodesics instead. First we need a little bit more vocabulary. 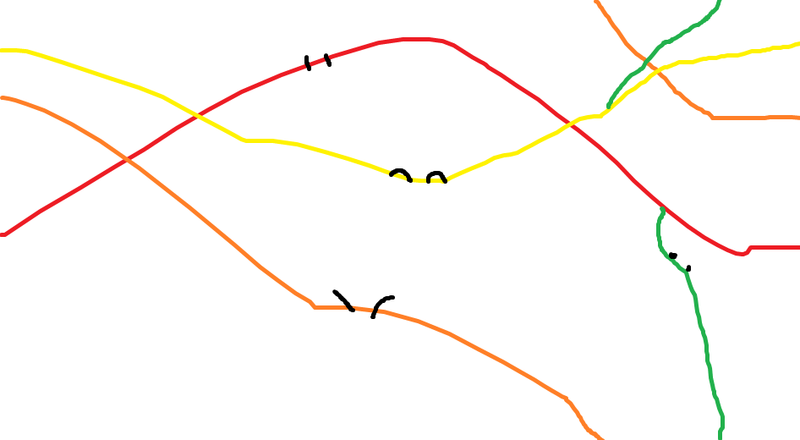 Let’s say I give you an arc and a simple (doesn’t self intersect) closed curve (loop) in a surface, and you wriggle them around up to homotopy. If you give me a drawing of the two of them, I’ll tell you that they’re in minimal position if the drawings you give me intersect the least number of times of all such drawings. 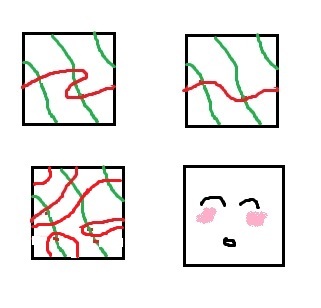 All three toruses have the same red and green homotopy classes of curves, but only the top right is in minimal position – you can homotope the red curve in the other two pictures to decrease the number of times red and green intersect. I just couldn’t make a picture w/out a cute blushing square. If you have three curves a, b, c all in minimal position with each other, then a reference arc for a,b,c is an arc which is in minimal position with b, and whose interior is disjoint from both a and c.
Now if you give me a series of curves on a surface, I can hop over to the curve complex of that surface and see that series as a path. If the path $latex v_0,v_1,\ldots,v_n$ is geodesic, then we say it is initially efficient if any choice of reference arc for intersects at most n-1 times. The geodesic is an efficient geodesic if all n of these geodesics are initially efficient: . In this paper, Birman, Margalit, and Menasco prove that efficient geodesics always exist if have distance at least three. Note that there are a bunch of choices for reference arcs, even in the picture above, and at first glance that “bunch” looks like “infinitely many,” which sort of puts us back where we started (infinity is a lot). Turns out that there’s only finitely many reference arcs we have to consider as long as . Remember, if you’ve got two curves that are distance three from each other, they have to fill the surface: that means if you cut along both of them, you’ll end up with a big pile of topological disks. In this case, they take this pile and make them actual polygons with straight sides labeled by the cut curves. A bit more topology shows that you only end up with finitely many reference arcs that matter (essentially, there’s only finitely many interesting polygons, and then there are only so many ways to draw lines across a polygon). So the main theorem of the paper is that efficient geodesics exist. The reason why we’d care about them is the second part of the theorem: that there are at most many curves that can appear as the first vertex in such a geodesic, which means that there are finitely many efficient geodesics between any two vertices where they exist. Here’s the link to the paper if you feel like checking it out. I DID NOT MAKE THIS PICTURE IT IS FROM BIRMAN, MARGALIT, MENASCO. But look at how cool it is!!! Look at this picture! The red curve and blue curve are both vertices in the curve complex, and they have distance 4 in the curve complex, and here they are on a surface! So pretty! If you feel like wikipedia-ing, check out one of the authors on this paper. Birman got her Ph.D. when she was 41 and is still active today (she’s 88 and a badass and I want to be as cool as she is when I grow up). Great post! Does the minimality condition on reference arcs also require that you can’t reduce the number of crossings between green and orange by sliding the endpoints of the green arc around? For example, in your picture, there’s a triangle between green, yellow and orange. If I take that triangle literally (which I’m probably not supposed to do) then sliding the green arc to the right along yellow will eliminate that point of intersection. Would that make the original green not a reference arc? Thanks, Jesse! My picture is misleading because the three original curves aren’t pairwise in minimal position, which means that green isn’t even a candidate to be a reference arc. But ignoring that to answer your question, I looked up Leasure’s thesis (https://www.lib.utexas.edu/etd/d/2002/leasurejp46295/leasurejp46295.pdf) where he defines reference arcs, and I think that endpoints are fixed (otherwise you can move arcs to be disjoint from whatever you want). In practice, since the interior of the arc is disjoint from the filling 1st and 3rd curves, any arc has to live in one of those polygons with sides labeled by 1st and 3rd. BMM consider (the finitely many) arcs with endpoints at the midpoints of those sides labeled by 1st, and say that any other potential reference arc encodes the same (intersection) info as these finitely many ones do.